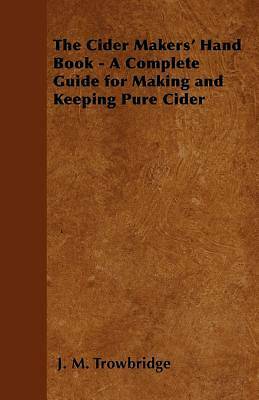 Originally published in 1890, this classic handbook provides a wealth of information on the processes of making and keeping of pure cider, and remains of interest and use to the cider maker or enthusiast today. The comprehensive guide provides expertise on the properties of cider, apple varieties, technical apparatus, and features a chapter dedicated to old-fashioned cider making methods. Contents include: Cider Making; Chapter 1 - introductory; Chapter 2 - The Properties of Cider; Chapter 3 - Apple Juice; Chapter 4 - Apples, Varieties, and Tests; Chapter 5 - Apparatus for Cider-Making; Chapter 6 - Straining and Filtering; Chapter 7 - Fermentation; Chapter 8 - Pasteurization; Chapter 9 - Old Method of Cider-Making. We are republishing this vintage work in a modern and affordable edition, complete with a newly written introduction and featuring reproductions of the original diagrams.